Clients often ask me how I became known as a fertility specialist. Well, I wasn’t always a natural fertility author and coach. 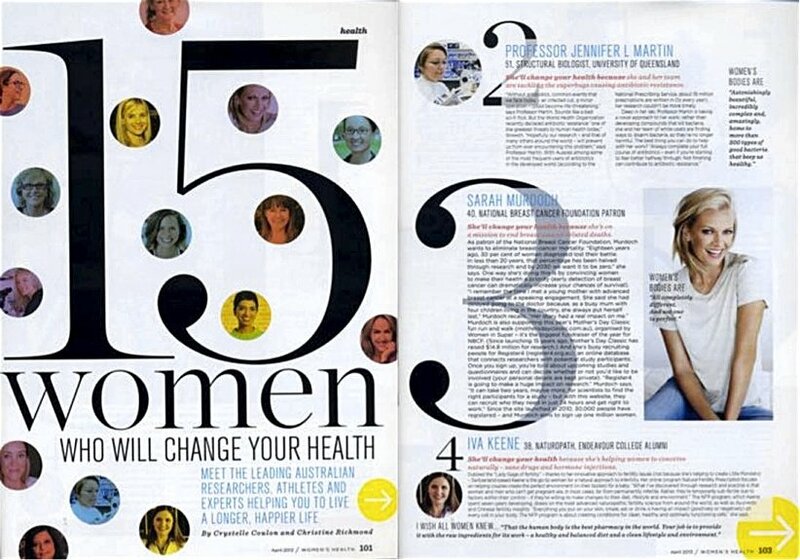 And I certainly wasn’t always a woman you’d see on the cover of a natural health magazine! You see, I used to experience severe pre-menstrual cramping & painful breasts every month. And I would take strong painkillers every time my period started. I had worrying breast cysts. And experienced mood swings and severe skin outbreaks. I ate too much processed food, was addicted to diet coke, snacking on biscuits. And I even smoked the occasional cigarette! I knew my health was less than perfect, and for a long time I looked in all the wrong places for a solution. Turning to conventional ‘health foods’, popular diet 'fads' and regular pharmaceutical ‘medicines'… I read mainstream media articles about health and wellness... trying to make sense of it. But not only did most of this 'health advice' not help. The contradictions and conflicting information left me feeling totally confused! For some time I really thought I was destined to be plagued by these symptoms forever! Later, when I studied natural medicine and slowly began to heal myself. I realised many of the ‘health solutions’ I’d been turning to and much of the mainstream information I’d been relying on had been making my problems worse! I realised that so much of this conventional health information, that we rely on and trust, was not serving me at all. Even more insidious were the foods marketed as ‘healthy’ which I’d been buying in organic health food stores, believing I was doing myself (and my body) a favour. Which I later found out were disrupting my hormone balance and causing me to gain weight! I couldn’t believe no one warns us about these harmful substances, which we’re led to believe, are good for us... or at the very least, doing no harm! Eventually I began to understand the pervasive influence exerted by powerful vested interests like big food and pharma lobby groups. It enabled me to grasp why respected media organisations could frequently publish articles about health topics that are inaccurate and/or scientifically flawed. I realised it was linked to advertising, pr and ownership incentive and other powerful and subtle forms of influence that do not serve us the health consumer. I began to understand and awaken to the reality that mainstream media (and even sadly some conventional medicine specialists) are not the most reliable sources of honest, accurate, helpful and effective health information. 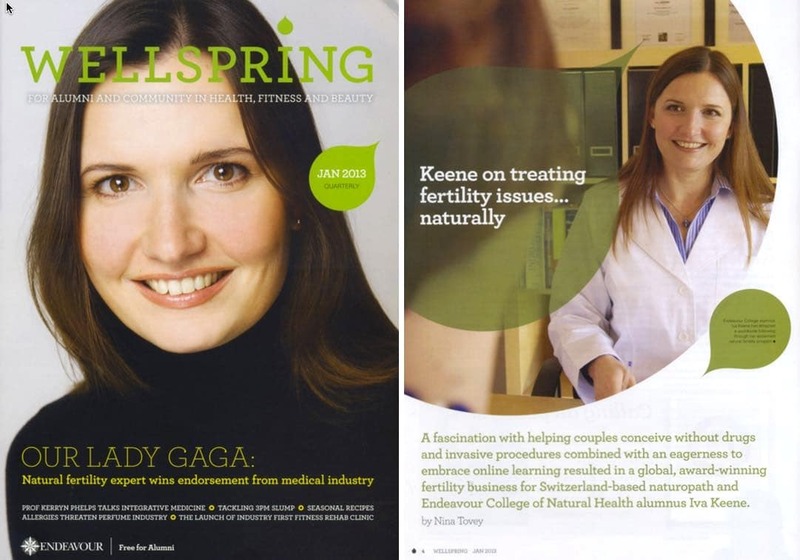 Yet once I began my clinical practice, I struggled at first to treat infertility in my patients… The standard naturopathic protocols did not always work. 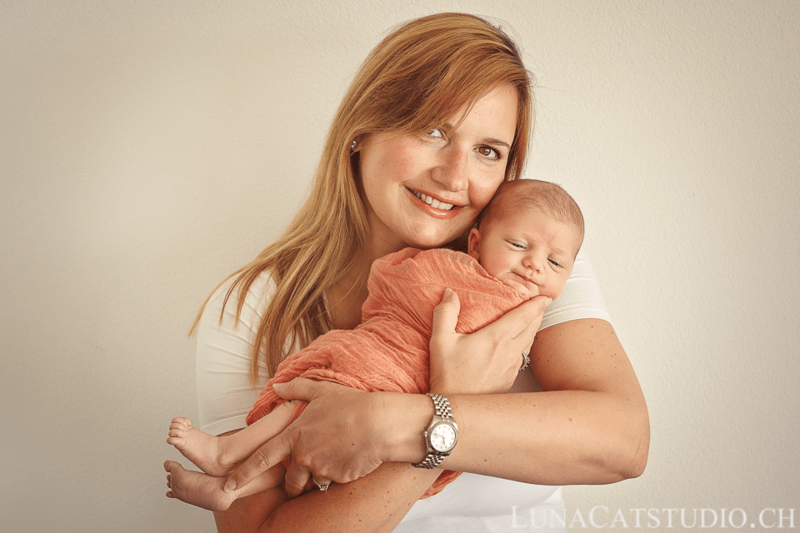 Plus: initially, I was somewhat afraid to treat fertility problems. Because I was dealing with the creation of a new life and I feel an enormous responsibility that goes with that. I’m acutely aware that it’s not just the patient but also the life of the baby. I remember one day realizing I was not up to it. Yet, do you know what? That one day caused my entire life to change. Because that day I declared it my mission to find ways to treat infertility naturally. Ways that are safe and that work consistently. I vowed to deepen my studies, read every book, find the right mentors & search under every rock if necessary. To successfully help my clients overcome their fertility problems and have healthy babies… I began to discover that infertility, far from being an unchangeable condition that can only be solved with IVF (as much of the mainstream media and medical profession would have us believe), could be more accurately described (in most cases) as a temporary state of sub-fertility which should usually be treated naturally in the first instance to optimise reproductive health, before turning to drugs or procedures. The truth, as I discovered is that the underlying cause of sub-fertility (in most couples) is various combinations of: metabolic toxicity, mild to severe nutrient deficiencies, hormonal imbalances, inflammation, emotional factors, immune issues, environmental factors, genetic polymorphisms and metabolic and other systemic issues (in one or both partners). As I found after dealing with hundreds of infertility cases, most of these factors could be solved, alleviated or managed with the right natural protocols. As time went on I began to find little-known information on pre-conception care going back several decades. Drawing on this pioneering but fragmented data, I synthesised it with more recent findings looking at hidden repro-toxins and fertility disruptors in our modern diets and environment, and their effect on different types of infertility. I was shocked by how prevalent these harmful toxins have become in our modern world and in our food and water supplies. And over time, I researched and developed practical ways for couples trying to have children to remove, avoid and detoxify from these substances. Then, drawing upon naturopathic 'food-as-medicine’ principles and using what i’d discovered about fertility-boosting foods, I developed my own fertility diet. Clients started telling me they loved the recipes and saw rapid changes in terms of energy, mood and weight-regulation. It also became clear that the standard fertility clinic tests focused on infertility symptoms and did not look at what I believe are critical, underlying fertility-linked factors such as immunity, deficiency and metabolic toxicity. ​So I searched for testing partners who could perform the diagnostic tests I wanted for my clients. These tests started revealing clear causes for clients who up till that point had simply received an ‘unexplained infertility’ diagnosis from fertility clinic doctors. I went through a similar process with nutritional supplements, sourcing only the best products I could find. Because I knew that most nutritional supplements, are weak, ineffective and of poor quality. Over time I developed and refined individual protocols for treating different forms of infertility naturally. And as I began to share my approach with patients who came to me with different forms of infertility, I started seeing consistent results. ​Clients who had been diagnosed with infertility and had been struggling to conceive (in many cases for years) began falling pregnant. Some patients had gone through 5 or 6 cycles of failed IVF over several years and were literally on the verge of giving up only to conceive naturally in their early to mid 40’s. ​And so the good news for you is this: not only did I figure out a blueprint and fertility protocols to help men and women overcome most forms of infertility without drugs and procedures...one that allows people like us to conceive naturally stay pregnant & give our children the best of ourselves and our partner and the healthiest possible start in life… and that enables us to experience the greatest joy & fulfilment of parenthood... even at advanced age for fertility. ​I also figured out a fertility diet that lets you enjoy your food and avoid feeling overwhelmed while doing it! ​And I've packaged the program into an online coaching system that makes it super easy for you no matter where you are located in the world, to take advantage of this method from the privacy and convenience of your home. ​This is the same fertility blueprint that’s allowed hundreds of my clients to reverse diagnosed infertility and have healthy children. And it’s the same exact blueprint I look forward to sharing with you so you can finally get pregnant, too! 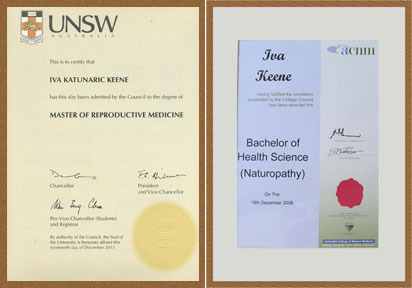 Iva holds a Masters in Reproductive Medicine from The University of New South Wales in Sydney Australia – one of Australia’s leading research and teaching universities. 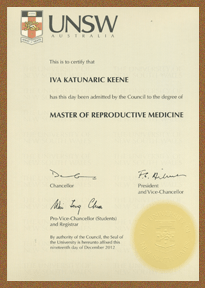 This post-graduate qualification extended Iva’s pre-existing expertise and clinical experience in the natural treatment of infertility and complements her naturopathic and health sciences skills in reproductive medicine. The Masters in Reproductive Medicine is focused on reproductive medico-scientific technology and includes study of reproductive physiology and endocrinology, assisted reproductive technology, reproductive medicine and psychosocial issues in reproductive health. 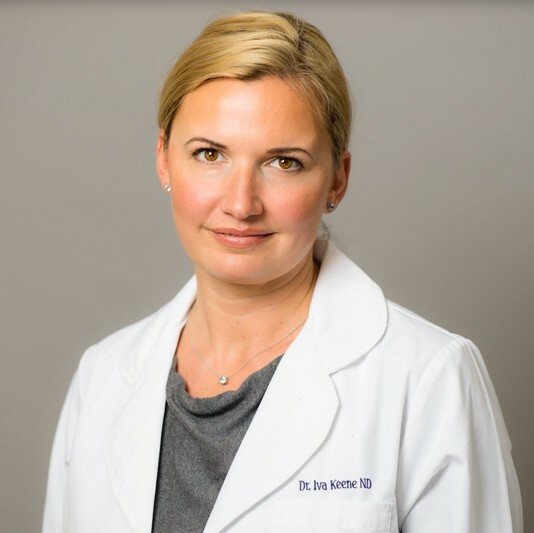 This knowledge has given Iva deeper expertise to interpret and advise on diagnosis provided to her clients by mainstream fertility medicine and how her natural fertility protocols can be adapted and used to complement reproductive technology. Endeavour College of Natural Health formerly Australian College of Natural Medicine was established in 1975. We are committed to the future and success of Natural Health both in Australia and internationally. Providing the highest standard of education, the most informed curriculum and constant expansion, Endeavour College of Natural Health is now Australia’s pre-eminent provider of education to the Natural Health sector. Our success at offering up-to-date, in-depth Certificate, Diploma and Advanced Diploma courses that exceed industry demands have been further expanded and developed. 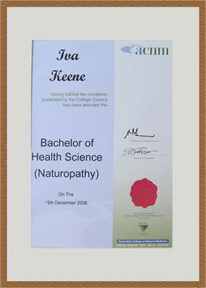 Endeavour College of Natural Health offers six Bachelor Health Sciences Degree programs. We have grown and developed with the demand for this growing industry. Today, we are the largest Natural Health college in the Southern Hemisphere with six campuses in Brisbane, Gold Coast, Melbourne, Perth and now in Sydney and Adelaide. 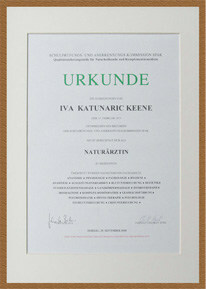 Iva is a certified member of the Naturärzte Vereinigung Schweiz (Natural Medicine Association of Switzerland). A professional association for qualified natural medicine practitioners and complementary therapists. The association was founded in 1920 and is now 90 years old making it the oldest and most reputable association of its kind in Switzerland. Principles since 1920 are: Assurance of qualifications and the professional quality of its members, Recognition of the profession in different jurisdictions, creation of public acceptance, with the authorities and insurance carriers, while maintaining the autonomy of the profession. 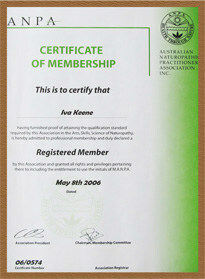 Iva is a long-standing, registered member of ANPA – The Australian Naturopathic Practitioners Association. The association represents Naturopaths who have received quality education in health sciences and natural medicine. Naturopaths in ANPA are trained in a broad range of treatment modalities and utilise these in the holistic care of their patients. ANPA is one of the longest established associations in Australia dedicated to the representation of professional Naturopaths to Governments, Health funds, Insurance Companies and the Public. As the specialist professional association for fully qualified Naturopaths in Australia ANPA is committed to quality health care and health information. 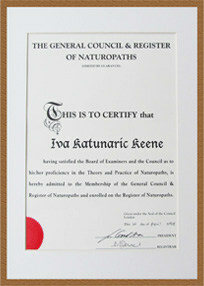 Iva is a certified member of the general council & register of naturopaths in the United Kingdom. The GCRN is the oldest regulator of the profession of Naturopathy in the UK. The GCRN ensures that members of the public receive safe, effective and ethical naturopathy. Its main activities are registration (publication of the Register), setting training standards and accrediting colleges, and the code of conduct for the profession. 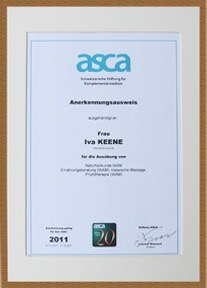 Iva is a registered member of the Swiss Foundation for Complimentary Medicine. One of the oldest regulatory bodies for complementary medicine in Switzerland.